I couldn't resist sharing this recipe for Valentine's Day. The plan is run Saturday morning, eat chocolate mousse Saturday night and up Sunday for another walk run. 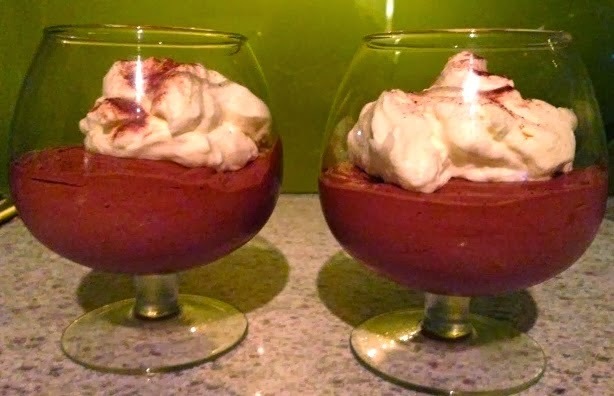 This chocolate mousse recipe is super easy to make and yes, guys you can make it for your special loved one! Place the chocolate in a heatproof bowl over a pan of gently simmering water Stir chocolate until melted. Remove bowl from heat and set aside to cool slightly. Place eggs and sugar in a large bowl and beat with electric beaters for approximately 5 minutes, or until mixture is pale, thick and doubled in volume. With spatula fold in cooled chocolate and cocoa powder until combined.